The movie starts out with a monologue, of a girl going through the Instagram feed of her ‘friend’ who didn’t invited her to her wedding. She is in tears as she sees the wedding photos on the gram and armed with a pepper spray she goes Down to the reception party and you can guess the rest. So, she is sent away by the state to an asylum or some sort of mental facility for a while because it turns out, she wasn’t friends with the bride , they only talked say once or twice and she imagined an entire friendship in her head. So this is clearly a case of assault and for obvious reasons she doesn’t go to jail. The movie takes us through her journey to reconciliation with Charlotte – the bride, who shows no interest in communicating with Ingrid, the protagonist of the story and goes a step further to take out a restraining order and block her off her Instagram. 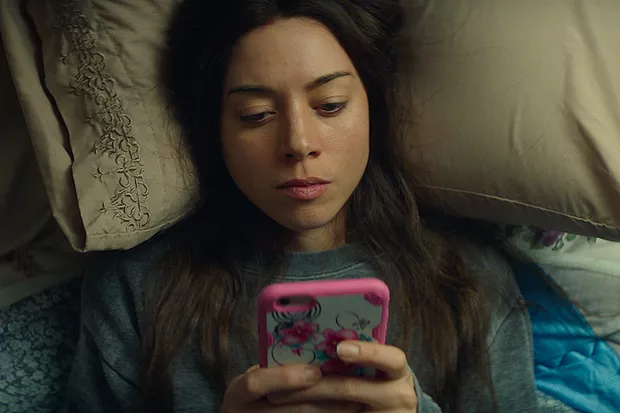 Ingrid (Aubrey Plaza) is distraught but soon finds another girl obsession in the person of Taylor (Elizabeth Olsen) , an Instagram influencer who replied her comment once. Ingrid is soon obsessed with Taylor and moves over to L.A where she lives. We see that she stalks Taylor, eats at her favorite restaurants, buys the same purses ,gets haircuts at the same salon and kidnapped her dog to get her attention. They soon become friends as Ingrid claims to have found the dog some block away and gets invited to dinner by the grateful Taylor and her husband, a great friendship is about to blossom – or not. Ingrid hangs off every word Taylor says and once had to borrow her Landlord’s truck just to get Taylor somewhere on time. Here, we see someone who’s a loner and quick to please. It’s a no brainer that when Taylor deceives her to buy her husband’s over priced art work, she falls for it. Ingrid’s mental imbalances come to light when she takes weird pictures of Taylor’s house, pictures in her bathroom and pictures of a sleeping Taylor. She is clearly in need of a friend that she becomes obsessed with anyone that shows the slightest interest in her. The next couple of scenes introduces Taylor’s brother, Nicky (Billy Magnussen)who is the life of the party, the crack head that Ingrid doesn’t like because she feels he steals the attention of Taylor from her, and he goes out of his way to pick on Ingrid for reasons we never know and Ingrid hates him, more because he can see through her façade and knows for a fact that she lied about having a boyfriend just to fit in,so she gets her landlord, Dan pinto (O’shea Jackson Jr.), to step in and play boyfriend. Nikki steals her phone and discovers pictures of his sister in it. He tries to cash in and blackmail her for 5kUsd a month. Tense, Ingrid gets her step-in boyfriend to kidnap him, take him to the desert and scare him off, but it goes awfully wrong. Nicky is injured and the cover is blown. Now, Taylor wants nothing to do with Ingrid who leaves several voicemail messages to apologize. The plot thickens at this point, as the movie exposes us more to Ingrid’s emotional issues which is getting to a climax. She spends the last of her inheritance to get a house next to Taylor who is still bent on ignoring her. Here, nobody wants to talk to Ingrid and she goes over to confront Taylor who calls her a loser. Ingrid points out that Taylor was once a loser too, before she became popular and she is living a fake like, pretending her husband is a world famous artist and that they have a happy life. Ingrid asks that Taylor understand that she’s new to town and is lonely , that’s why she’s so attached. Taylor is adamant and sends her away, instead. Distraught, Ingrid makes a video on her Instagram where she tells her followers that she’s not as Happy as she looks on the gram, that she is lonely and sad, she feels that something is wrong with her and doesn’t know how to help herself. She decides to end her life and overdoses on camera. She captions her video with the hash tag #IAmIngrid. The final scene opens with Ingrid in the hospital and the nurse tells her how lucky she is to be alive and how she has a lot of fans who sent flowers and balloons to her at the hospital. It turns out that Dan had seen the viral video and called 911 – the single act that saved her life. He shows her the comments on Instagram, thousands of people around the world showing a lot of support to her and at this point the hashtag had become a trend. Here, the film ends. We never get to know what happened with Taylor and if Ingrid got better, but we know that she got a lot of support from the Instagram community and a lot of people asking to be her friends. I have seen quite a number of movies on the metal health topic but this is my best so far, and for good reason. For the first time, I see a movie that portrays someone with metal health issues for what they are – sick , and not a psychopath. I have seen a movie where the person with mental health went on killing people who refused to be her friend, taunted her or stopped talking to her and this kind of defeats the purpose of bringing the discussion to the table. Awon mind reader oshi, please tell us when Jesus will come, since you people know everything . Over the past few years, there has been a steady increase in suicide especially in the city of Lagos and this kind of brings the discussion to limelight but sadly nothing is being done and unlike what is obtainable in western countries, there is no facility for care of mentally Ill patients in my country and it is pertinent to state here that mentally Ill does not always translate to a psychiatric case. Depression, bipolar disorder and whole lot of others do not fall into the category of ‘madness’, yet unfortunately in my country, when the topic comes up, one is quickly referred to ‘yaba left’ , the colloquial of an asylum in the metropolitan city of Lagos. Ingrid goes west , makes me proud that mental health is beginning to take the front burner , what with the increase in mass shootings, domestic violence and suicide. The movie passes the message of a sad, lonely and depressed person and not the psychopath people think depressed people or people living with mental health issues are. It shows also that people live fake lives on the internet and a lot of people try to be like and act like them. It passes the message that this is just a façade and its okay not to be a cool kid. I like the fact that when she tried to commit suicide, there was an outpour of love and support and not critics saying she’s trying to get attention or a pity party. It was amazing how people from different parts of the world rallied around a total stranger. It was also interesting how the person she least expected turned out to be the one there for her and not the one she had been trying to impress. This movie gives off soo much hope that the world can be better, that maybe someday we would love ourselves again. I strongly recommend this movie for us, to educate ourselves and not always write off depression as a sign of weakness. I am also hoping that more movies like this will be made and more focus will be put on the 3rd world African countries where things like this are largely misunderstood and written off as spiritual cases. Children or adults who are living with mental health issues are largely regarded as psycho, badly behaved, or introverted. It is unfortunate as well as sad, that these are the discussions we never had. You have said it all, I have nothing to say again but only going to go and download the movie now. see ya.